Posting from my phone today... E's sick at home, so I'm out having a big time birthday by myself. Mom and Dad offered to watch the kids so E could be in peace and I could do something for my big 3-1. 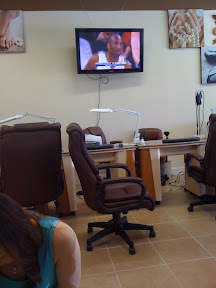 My first stop was Pedicure Town, USA. Nobody else there, so I got some extra leg time. Nice. Really, though, with the basketball??? In a nail shop? Pass. Peace out, Kobe. I left and bought some new nose studs at Claire's--I'm embarrassed to shop in that store, but they're the closest store that carries studs besides Wal Mart. 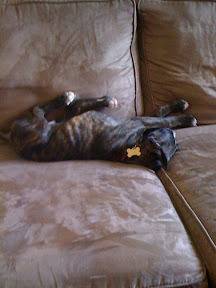 I wasn't in a Wal kind of mood today. 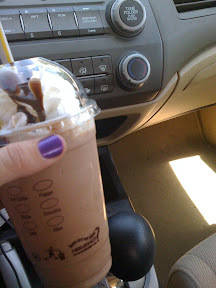 I did stop and treat myself to a McD frappé. Not so bad! Of course, I'll admit this snack has no nutritional, trendy, or cool value. But for junk food? Bueno! Oh man, you can't really read it in the pic. But they made me laugh. 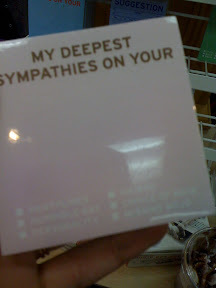 On the top it says "my deepest sympathies on your" and the first one on the bottom was "pantylines." Huh. Next up? Cheap Haircut City. Can't afford my regular stylist right now, but something needed to happen with this big mop. Scratch that. Ran out of time. Grocery store, then I picked up the kiddos. Not too exciting, but a nice little birthday break. Turned up the acoustic girly rock and had a sweet little drive around on my Sunday.